Infants who receive sweet solutions before being immunised experience less pain and are more comfortable, reveals research published ahead of print in the Archives of Disease in Childhood. Healthcare professionals should consider giving infants aged 1–12 months a sweet solution of sucrose or glucose before immunising a child, the international team of researchers recommended, because of the child’s improved reaction to injections. Existing research shows the effectiveness of giving newborn infants and those beyond the newborn period, a small amount (e.g. a few drops to about half a teaspoon) of sucrose and glucose as analgesics during minor painful procedures. 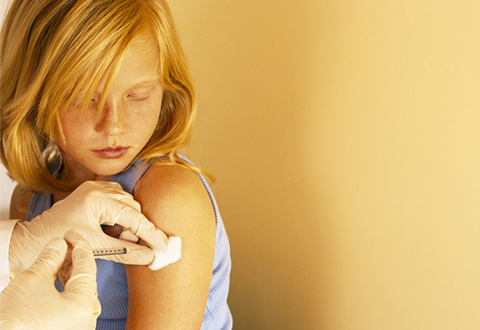 Little is known, however, about the effect of such solutions on pain, so a team of researchers from Toronto in Canada, Melbourne in Australia and Sao Paulo in Brazil, funded by a Canadian Institutes of Health Research Knowledge Synthesis grant, collected the findings from 14 relevant trials involving 1,674 injections given to children aged 1–12 months. They found that giving a child a small amount of sweet solution, compared to water or no treatment moderately decreased crying in the child during or following immunisation in 13 of the 14 studies (92.9%). The authors conclude that infants aged 1–12 months given sucrose or glucose before immunisation had cried less often and for less time. The amount of glucose or sucrose given made a difference and the researchers found that infants receiving 30% glucose in some trials were almost half as likely to cry following immunisation. The researchers could not identify the ideal dose of sucrose or glucose because of the variety of volumes and concentrations used in the various trials. Analgesic effects of sweet solutions given to older infants were more moderate than those in newborn infants. They conclude: “Healthcare professionals responsible for administering immunisations should consider using sucrose or glucose during painful procedures.